On Thursday Dave and I went to the Vintage Canton event held in Downtown Canton -- it was a fun evening of food, wine tastings, and music. Tickets were $30 per person if purchased prior to 5:00 p.m. the day before the event, and then $40 at the door. Each ticket was good for 8 tastes -- 2 ounce wine pours/5 ounce beer pours -- you could mix and match or just stick to beer or wine. The streets of city center were closed down and a "passport" was provided which included a list of beverages, a map, and a place for tastes to be counted. All attendees also got a Vintage Canton wine glass to take home. One of our Wine Passports. We decided at first to try to stick with wineries and have Dave order beer later in the evening if we still had tastes left on our ticket. Our first stop was Gervasi Vineyard, based in Canton. connoisseur because I enjoy incredibly sweet wines, Brigante didn't quite pass the test. I've been to Gervasi Vineyard before though, they have a gorgeous patio, we also enjoy Crush House and Twisted Olive, also by Gervasi. Next we tried wines by Sweet Tulip and Reggae both sold by a distributor based out of Indianapolis, Indiana. The entertainment for the evening was provided by The Ohio Weather Band, a group based out of Akron, Ohio. You can hear them live at various events throughout Ohio, check out their website for a schedule of shows and more details about the group. Our next wine stop was at Raven's Glenn which is located in West Lafayette, OH. They promised picturesque views of the Tuscarawas River if we were ever able to take a trip to their winery for a visit. 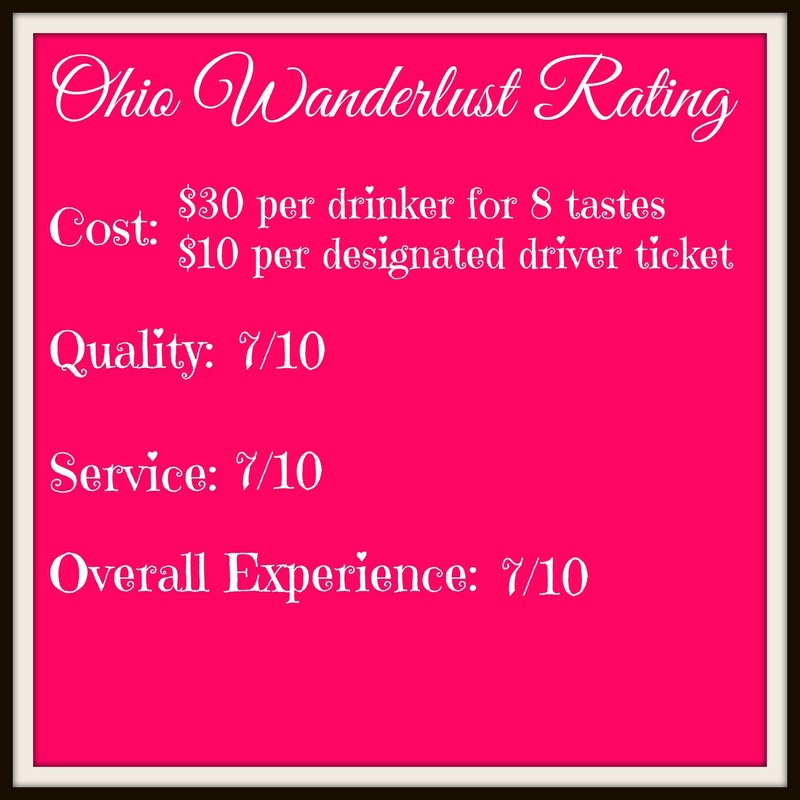 The drive from Uniontown doesn't look too bad, so I've added it to our list of places to review. I ordered Autumn Interlude (based solely on the name) and Dave selected Moon Dreams. We also visited the table for Baltic Mill Winery based out of Baltic, OH. I selected the Just Peachy and Dave tried Blend No. 111. Baltic Mill Winery is housed in what was formerly Ohio's largest flour mill, the wine was good and we're looking forward to visiting Baltic, OH to check out this unique location. Next stop was Swiss Heritage Winery located in Dover, Ohio, I selected the Rhubarb Strawberry, we also tried Cheesemaker's Red, and Sweet Thunder. The Rhubarb Strawberry was so good, I'm going to need to visit their winery and purchase a few bottles for my personal collection. At another wine tasting event we attended, I first tried mead and didn't enjoy it at all. For Vintage Canton we decided to give mead another go and visited McAlpine Meadery located in Beach City, OH which ironically doesn't appear to be near a beach. The men of McAlpine Meadery assured me that if I liked sweet wines, I would enjoy their Orange Blossom Mead, and they were right, I found this sample much more enjoyable than the first time I tried mead. I don't know if I'm a mead drinker yet, but this certainly inspired me to try mead again. We also stopped by the table of Barrel Run Crossing Winery our local favorite located in Rootstown, OH. Dave and I have tried all of their wines before, but we sipped on some Cattle Dog, an apple wine made with a blend of Ohio apples grown on site and at other local orchards. There were several food vendors with items available for purchase, we were drawn to Chocolates By Erin based out of Massillon, OH because she had samples at her table. This pretty chocolate with cayenne pepper was the sample that intrigued us the most. 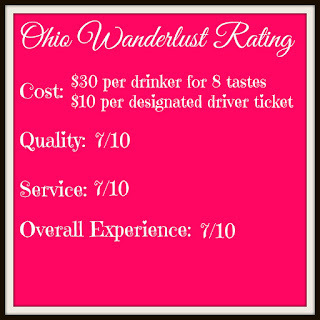 We're looking forward to visiting and reviewing Erin's shop next time we're in Massillon. The weather last Thursday was picturesque, Vintage Canton had bread, cheese, and crackers available from Brewster Cheese. It was nice to get 8 samples, plus have some food to munch on that didn't cost any additional money, while we were there the crowds were pretty large and although we didn't need to wait in long lines at any wine tables, we liked to take a break to eat some cheese between wineries. We had a fun night out at Vintage Canton and it was nice to try wines from wineries that we weren't familiar with, we spend a lot of time in Northeast Ohio and haven't done too much exploring otherwise. We're excited to try new locations with our friends now that we've been introduced to some great wineries. Although there were quite a few people at the event when we arrived, we only occasionally waited in line for samples -- and even then the lines were not long. The set-up at Vintage Canton was better than other events I've attended, there was plenty of room to visit each table without constant interruption from people trying to walk to other tables. However, there were quite a few distributors there, and we really prefer to try local wineries at events like this. We also disliked that we weren't able to purchase bottles of wine from the vendors like at similar events in the area. Lastly, it was disappointing that there wasn't free admission, we really didn't need 16 tastes between the two of us and would have been happy splitting our samples, but without free admission, we were paying a fee either way.